Doctors Shuvo Ghosh and Andreea Gorgos, owners of Café Pacifika and the Meraki Health Centre, pay special attention to trans youth. Photo by Lily Bennett. 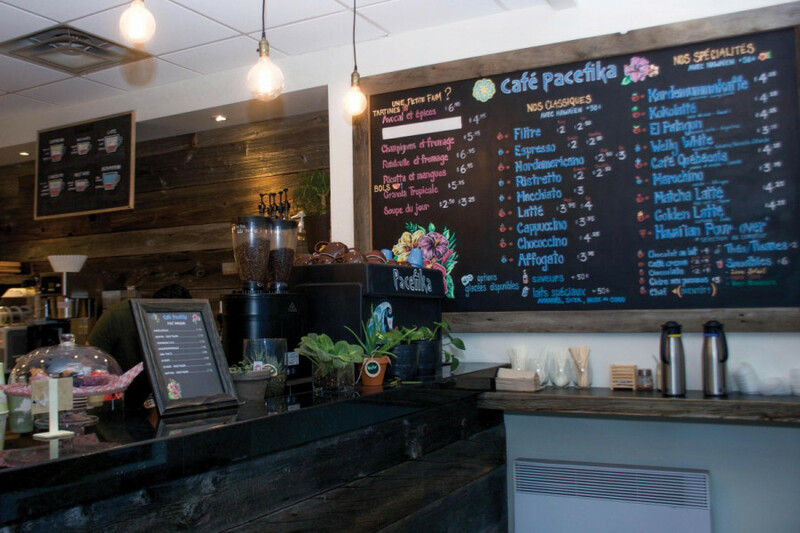 A fifteen minute walk from the Concordia downtown campus is the relatively new Café Pacefika. This little café has a vegan and vegetarian menu, uses coffee beans from direct trade, and most importantly, is a not-for-profit. Café Pacefika opened its doors in November 2016. The owners are two doctors, Shuvo Ghosh and Andreea Gorgos, a charming power couple who also operate the Meraki Whole Person Health Centre clinic, which is located just next door to the café. The MWPHC is the only clinic in Quebec that offers medical and psychological services that are specifically catered to trans youth. While the clinic’s medical services are covered by RAMQ, Quebec’s health insurance plan, psychological services are not. These services can be costly to patients seeking help, which is why Dr. Ghosh and Dr. Gorgos decided to open up their own not-for-profit café and direct all of the profits towards funding services at the MWPHC. Dr. Ghosh and Dr. Gorgos, both pediatric doctors at the Montreal Children’s Hospital, started the MWPHC in 2015 when the Children’s moved to its current location at the Glen site. In 2015, the Couillard government cut $583 million from its provincial health care spending, which forced the McGill University Health Centre to cut an additional $21 million budget, in addition to the already substantial $50 million in cuts from the previous year. When the Children’s Hospital announced it was cutting programs offered to trans youth, youth with developmental problems, and gender variant youth, Dr. Ghosh and Dr. Gorgos took it upon themselves to open their own clinic, which would continue to offer these specialized programs to their patients. Patrons can find vegan and vegetarian food options at Café Pacefika, as well as coffee from direct trade beans. Photo by Lily Bennett. Dr. Gorgos explained that if their patients, who are predominantly children and young adults, are seeking psychological services but do not have private insurance, they must either pay out of pocket or be put on a waiting list at a hospital. “It could be a two or three year waiting list, and they might never get seen,” Dr. Gorgos said. That’s where the café comes in. Since 2015, Dr. Ghosh and Dr. Gorgos watched the space next to their clinic change hands over and over again. The small but cozy space right off of Lambert Closse St. is owned by an accountant, Tony Bertucci, whose office is directly above the clinic. According to Dr. Ghosh and Dr. Gorgos, Bertucci had a hard time finding the right ‘fit’ to occupy the space. At one point, a gym operated out of the building. With the MWPHC waiting room right next to the space, according to Dr. Ghosh, patients and their family members had the unfortunate experience of having derogatory slurs said to them by gym patrons on multiple occasions. After the gym folded, Dr. Ghosh and Dr. Gorgos seized the opportunity to use the space for their own business: Café Pacefika. The idea was to create a café and have all the profits go towards funding programs at the MWPHC that are not covered by RAMQ. Since the business is relatively new, they haven’t gotten there yet. But Café Pacefika is well on its way to offering substantially cheaper, and potentially free, services for children with developmental issues, psychological and occupational therapy and speech pathology. “Our aspiration is that as soon as we reach some profitability, it’s actually all directed into the clinic. But we haven’t quite hit that point yet, in our first seven months,” Dr. Ghosh said in July. The two discussed opening up their own café for about 10 years. The bubbly and positive couple had travelled extensively and had been to cafés all over the world. Dr. Ghosh is originally from Chicago and moved to Montreal to do his fellowship at the Montreal Children’s Hospital through McGill University. Dr. Gorgos was born in Romania, where she lived until the age of 15, when she immigrated to Montreal with her family. Dr. Ghosh speaks roughly nine languages, Dr. Gorgos six. They have big plans for Café Pacefika. Both vegetarians, the couple wants to offer vegetarian- and vegan-friendly options to customers. They also want it to be as environmentally friendly as possible, which is why they hired Jeff Helberg to be their resident chef. Helberg, a recent Concordia graduate, volunteers at the Concordia Food Coalition and is a collective member at Food Against Fascism, an organization dedicated to battling the rise of the far-right through the promotion and distribution of free hot meals and pamphlets on anti-fascism and social justice around the Concordia University downtown campus. “One of the goals coming on was to make everything as organic and local as possible. Because we’re a not-for-profit, we have a bit more leeway to be able to take those kinds of risks,” Helberg said. Helberg expressed how important it was for him to work for a not-for-profit where funds were going towards a good cause. The café’s best sellers are currently a mushroom ragu, a ratatouille sandwich, and their avocado toast. Helberg plans on revamping their menu, adding a dal toast with mango chutney and the organic scones that he sells at the Concordia Farmers Market. According to Helberg, the café gets their coffee beans using direct trade, a term generally meaning that farmers are paid fairer wages and trade is beneficial and transparent for both the farmer and distributor. Café Pacefika has two distributors. Kai Coffee Hawaii, a company which is located in Maui, Hawaii and owned by friends of Dr. Ghosh and Dr. Gorgos, is one. The company grows their beans locally and hand roasts them. The second distributor is an Italian company called Caffe Bertoni, and is operated by Bertucci and his family. The café itself is welcoming and cozy. It has warm lighting and a definite “Hawaii island” decor. The baristas are friendly and down to earth. Lucas Larochelle is currently studying design at Concordia University. Not only is Larochelle a barista at Café Pacefika, but Dr. Ghosh and Dr. Gorgos asked them to help out with marketing and the design for the café’s decor. According to Larochelle, all of the baristas earn $12 an hour plus tips. Larochelle is involved with Pervers/Cité, a coalition of radical queer individuals who organize workshops, events and panel discussions. 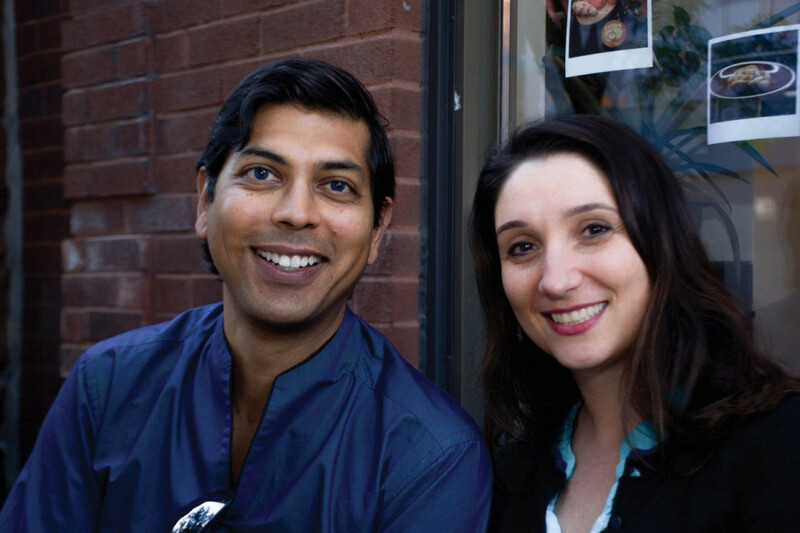 Dr. Ghosh and Dr. Gorgos held three workshops for Pervers/Cité at Café Pacefika in August. Like Helberg, Larochelle expressed how good it feels to be working at a not-for-profit. Maria Scolack is the clinical coordinator of the Gender Variance Program at the MWPHC. With a masters in educational psychology from McGill University, Scolack first did an internship with Dr. Ghosh at the Children’s Hospital. When the clinic was looking for a coordinator, Scolack jumped on because she had already worked with many of the MWPHC’s patients at the Children’s Hospital. Scolack explained that because the MWPHC is the only clinic in the province of Quebec to offer specific services to trans youth, they’ve ended up with extremely long waitlists. “When we try to refer outside [of the clinic] to CLSCs, even just for therapy or any kind of follow up, it’s the topic [of trans youth healthcare] that seems to be very difficult to grasp. And there also doesn’t seem to be much interest in getting to know more about it,” Scolack said. She explained that recently the clinic had tried reaching out to family doctors in Montreal to see if they’d be willing to learn more about trans youth care, but they were met with apathetic responses. Right now, the MWPHC employs 10 part-time physicians. In terms of services for trans youth, the clinic offers psychosocial support, the initial assessment and identification process, and eventually hormonal therapy and transitional support for older adolescents. The clinic does not offer surgical transitions to their patients. The clinic also offers occupational therapy, speech-language pathology, psychological services for children with developmental issues, psychosocial or behavioural difficulties, or any other specific health condition for members of marginalized communities. Unfortunately, most of these services can be costly. When funding from Café Pacefika starts coming in, patients will be able to receive these services for substantially lower costs.